John started his early musical life as a drummer (yes, he admits it) but by some miracle got hooked on traditional music in his teens. 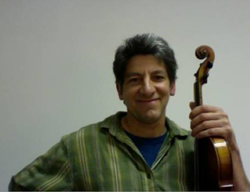 Upon moving to Maine in1989, he helped establish the North Whitefield Contra Dance with famed caller Ted Sannella and the bands Calliope and The Usual Suspects, and continues playing for dances today with Henry Road and Sassafras Stomp. Since moving to Belfast in 2017, he has joined the Leaky Boot Jug Band on fiddle and harmonica.